Warren Buffett remains optimistic about the stock market and the economy in the United States. But he's not a raging bull. 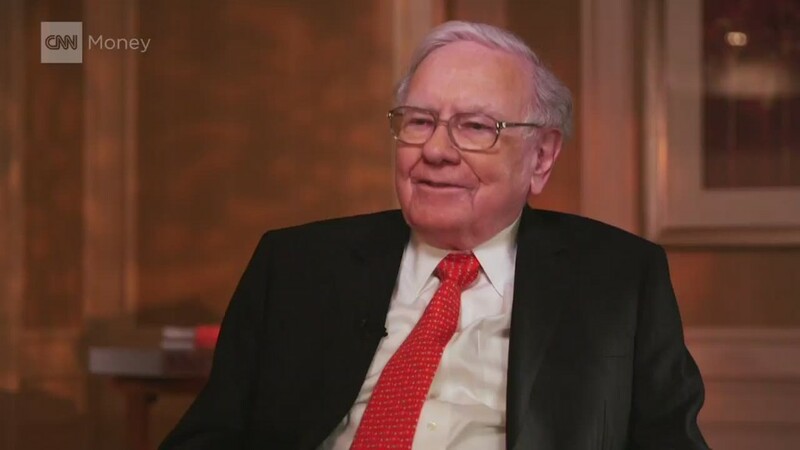 Buffett told CNN's Poppy Harlow that there are "very few" stocks he's looking to buy right now. He discussed his thoughts on the market and economy -- as well as the controversial religious freedom law in Indiana and his support for Hillary Clinton -- in a wide-ranging interview. But most Wall Street observers pay attention to Buffett because he is an investing guru. His company -- Berkshire Hathaway (BRKB) -- is one of the largest investors in Coca-Cola (KO), Wells Fargo (WFC), IBM (IBM) and American Express (AXP). Berkshire's market value has enjoyed a compounded annual gain of 21.6% over the past 50 years, compared to 9.9% for the S&P 500. Berkshire owns auto insurance giant Geico, railroad Burlington Northern Santa Fe and well-known consumer brands like Fruit of the Loom and Dairy Queen. It also agreed to acquire Duracell from Procter & Gamble (PG) last year. And just last week, Heinz (which is co-owned by Berkshire and private equity firm 3G Capital) announced it would merge with Kraft (KRFT). Here are some of the most interesting things he had to say about stocks and the economy. Market not overly expensive but not cheap either. Buffett said stocks "might be a little on the high side now, but they've not gone into bubble territory." Buffett, who has shunned many high-growth tech stocks, also said he was not worried about the Nasdaq getting back near the all-time highs it hit in 2000. He noted that the valuations of Apple (AAPL) and many other tech companies are based on actual earnings instead of hype. "They were eyeballs then, and they're profits now in many cases," he said. Related: Heinz buys Kraft: Buffett must really love mac & cheese! Still, Buffett isn't loading up the truck to make new investments. "I don't find cheap stocks to buy either," he said, adding after follow-up questions that there were "very little" and "very few" bargains out there right now. The economy is resilient. Buffett continues to think that the U.S. economy is on the right track. "I don't see any real weakness in the economy. Home building has been slow and it continues slow, but the economy has been improving since the fall of 2009, and it continues to improve," he said. Buffett added that this is even more impressive when you consider just how bad the economy and stock market were in 2008 and early 2009. "It's quite a tribute actually to our policy makers all the way back to the fall of 2008 that we've recovered like we have from what was an incredible panic," he said. Income inequality is still a concern. Buffett is one of the wealthiest men in the world. And he recognizes that his fortunes have risen at a much higher rate than average Americans. "The extreme rich are clearly winning. If you look at the Forbes 400, they had an aggregate net worth of $92 billion in 1982. It's $2.3 trillion today," he said. He added that society needs to figure out ways for many people to be doing better than they are currently. "We live in a country that has $54,000 GDP per capita and is the richest country in the world and a miracle in many ways. Real GDP is 6 times what it was per capita when I was born, but all kinds of people are left behind," he said. Tax reform better than minimum wage increase. Several states and cities have enacted laws to raise the minimum wage -- even though the federal government hasn't. Wal-Mart (WMT) and TJX (TJX) -- the owner of Marshalls and T.J. Maxx -- recently announced plans to boost wages to $9 an hour. Target (TGT) is reportedly considering a similar pay hike. And McDonald's (MCD) just boosted pay for workers at its company-owned restaurants. Stagnant wage growth is viewed as one of the biggest problems in the economy right now. But Buffett said raising the minimum wage could have unintended consequences. "I'd like to see everybody make $20 an hour at a minimum, but I know if you increase it $20 an hour, you'd have millions of people unemployed." Buffett thinks increasing the amount of money that lower-income workers get as a tax credit could do more for the economy. "The earned income tax credit is a much better way of handling the problem of people who are really not paid enough to live decently," he said. "I would expand that a lot, and I would do it smarter too. That's more effective in helping the people who are really at the lower end than actually a change in the minimum wage."